Dean Lewington may be converted into a central midfielder after manager Paul Tisdale rolled the dice with his skipper on Tuesday night against Luton. 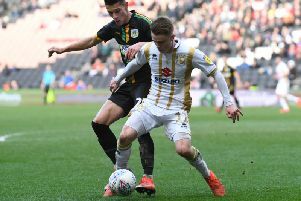 Lewington has been a regular throughout his time at MK Dons at left back, occasionally trying his hand in the centre of defence. In recent seasons, Robbie Neilson and now Tisdale have experimented with playing three centre backs and two wing backs. On Tuesday night, Lewington played the opening 45 minutes in the centre of the park at Kenilworth Road alongside the inexperienced David Kasumu. Tisdale believes it could be a position Lewington could becoming attuned to and wanted to use the Checkatrade Trophy game as an experiment going forward.